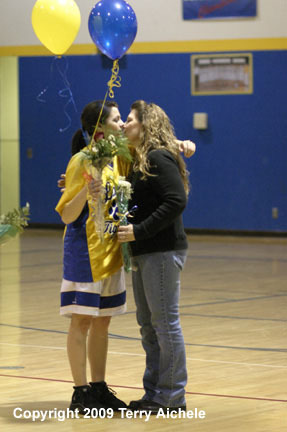 TOP - Mikayla Baros gets a kiss from her mom, Debbie, during the celebration for the senior players before the girls Friday night game with Weston McEwen. 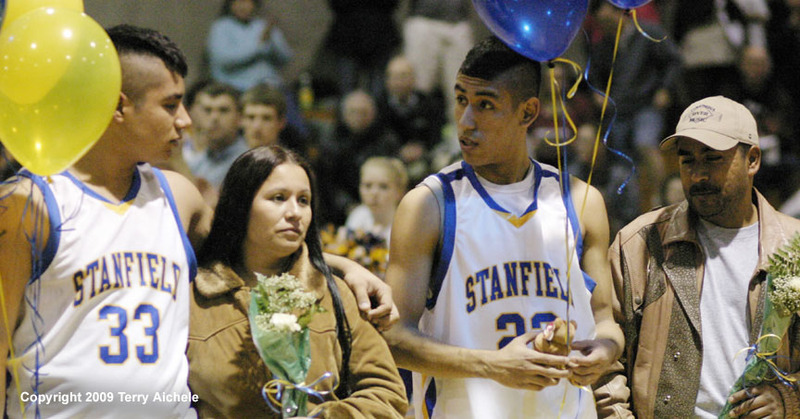 Omar Ibarra with his mom Virgina left, listens to Hector Esquivel who is with his father, Elias during the celebration for senior players before the boys game with Weston-McEwen. The activities took place before each game. 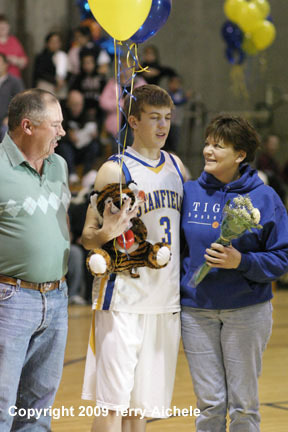 STANFIELD - The Stanfield Tigers celebrated the senior players on the boys and girls basketball teams and the one senior cheerleader. Senior year is as much about endings as beginnings. Twelve long years of education come to a conclusion with graduation in the spring. The entire senior year is studded with endings. The last football game, the last prom, the last book returned to the library, the last gathering before graduation, the last paper that needs turned in, and the last test. 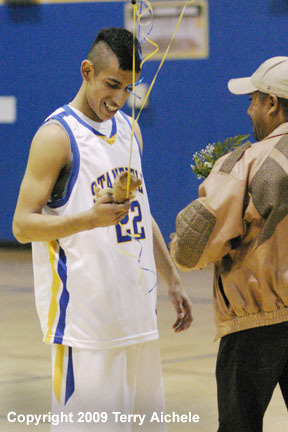 The end of winter sports means the the high school student athlete's journey is nearing its end. For many schools it's only a little over three months to graduation. One more short sports season and the high school years are done. Gone. Living on memories and friendships. And for some, a lucky few, college sports beckons. Seven seniors were acknowledged during the pregame activities before the girls game. 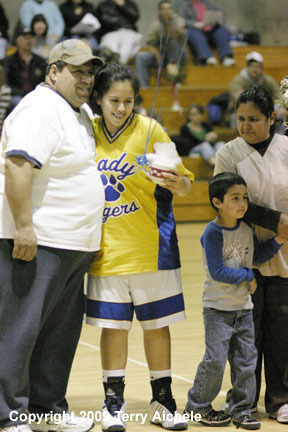 There was one cheerleader, Yessnia Morales. There were six basketball players Nathalie Cook, Tara Nichols, Jade Martinez, Erica Gehrke, Mikayla Baros, and Jessenia Carrillo. 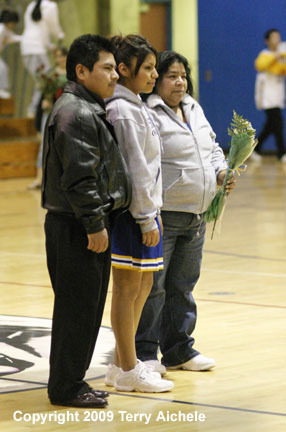 LEFT - Stanfield cheerleader Yessenia Morales and her parents Isabel and Margarito. RIGHT - Nathalie Cook is greated by her mother, Melody. 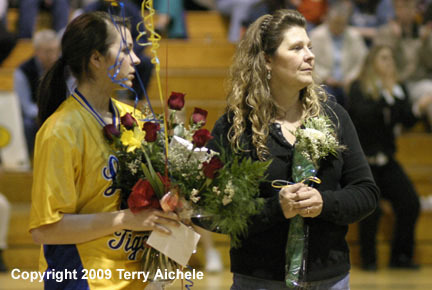 LEFT - Nathalie Cook and her mother, Melody. 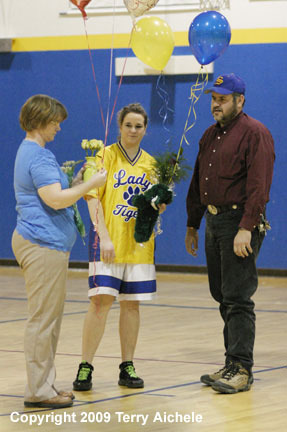 RIGHT - Tara Nichols is accompanied by her parents Clara and Tod. LEFT - Jade Martinez is greated by Chase Blevins. 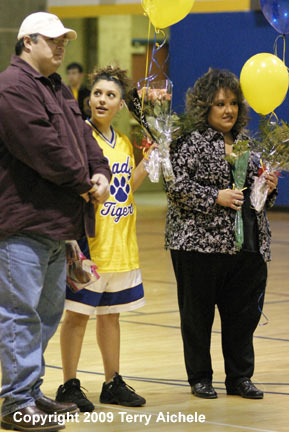 RIGHT - Jade Martinez looks up at her dad Joe, to her left is her mother, Mindy. 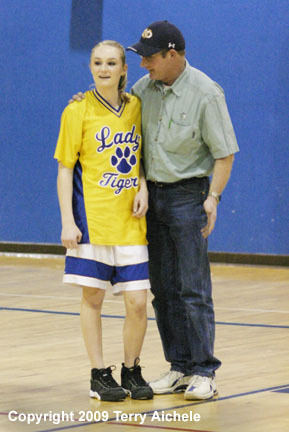 LEFT - Erica Gehrke is huged by her dad, Merle. 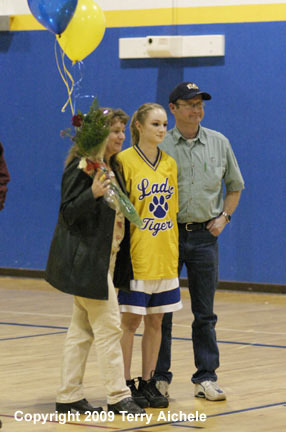 RIGHT - Erica Gehrke is flanked by her parents, Monica and Merle. 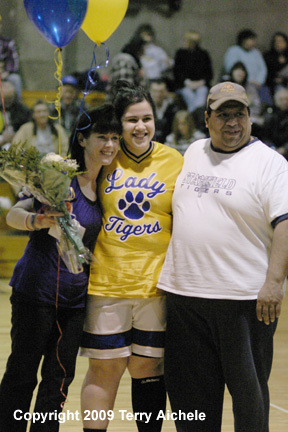 LEFT - Mikayla Baros with her parents Debbie and Victor. 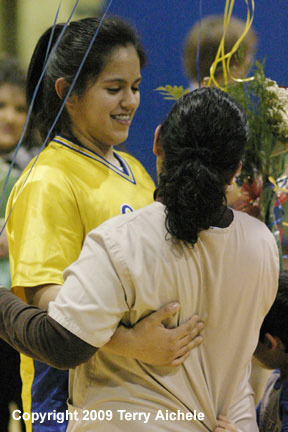 RIGHT - Jessenia Carrillo gets a hug from her mother, Maria. 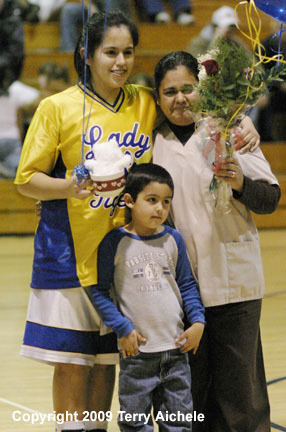 LEFT - Victor Baros gives Jessenia Carrillo a hug during the senior night activities. 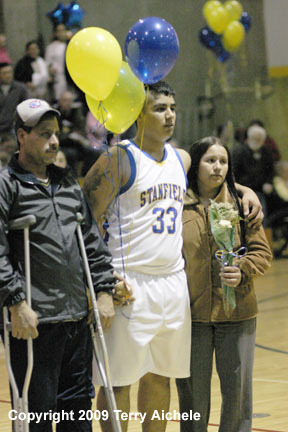 RIGHT - Jessenia Carrillo with her mother Maria and her brother. LEFT - Hector Esquivel takes a look at the stuff tiger his father, Elias gave him. 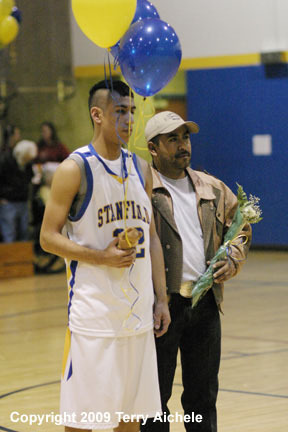 RIGHT - Hector Esquivel and his father Elias. 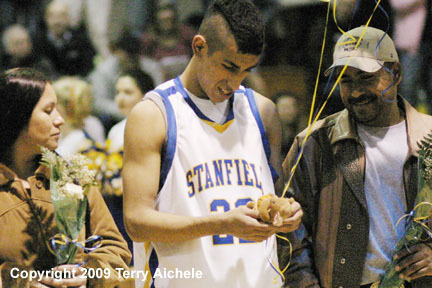 LEFT - Hector Esquivel takes another look at the stuffed tiger. 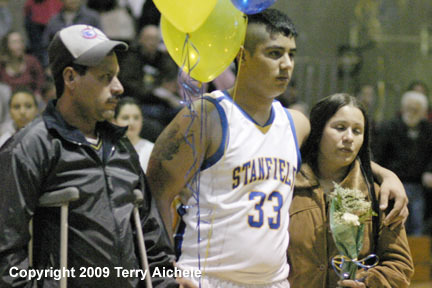 On his right is Virginia Ibarra and on his left is his dad, Elias. 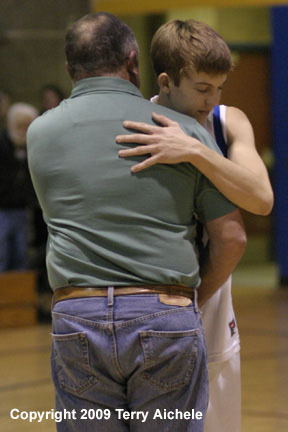 RIGHT - Tyler Hawkins is hugged by his dad Randy. 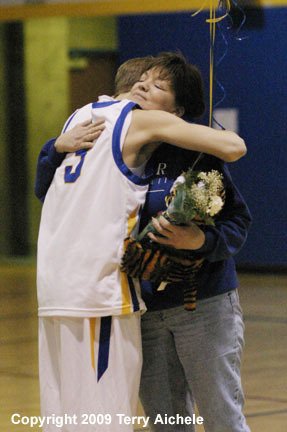 LEFT - Tyler Hawkins is hugged by his mother, Karen. 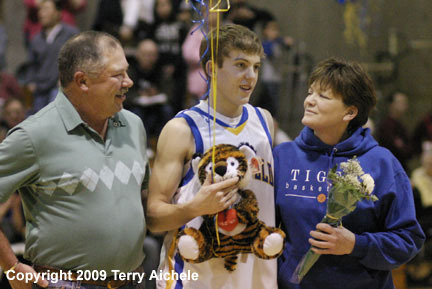 RIGHT - Tyler Hawkins is flanked by Randy and Karen.